Who would have guessed an answer like this? After the singer revealed how he showered with each member one by one in order to get closer to them, the curious cast questioned who he thought had the best body that any man would be jealous of. Without any hesitation, Baekhyun replied that it was clearly Sehun. 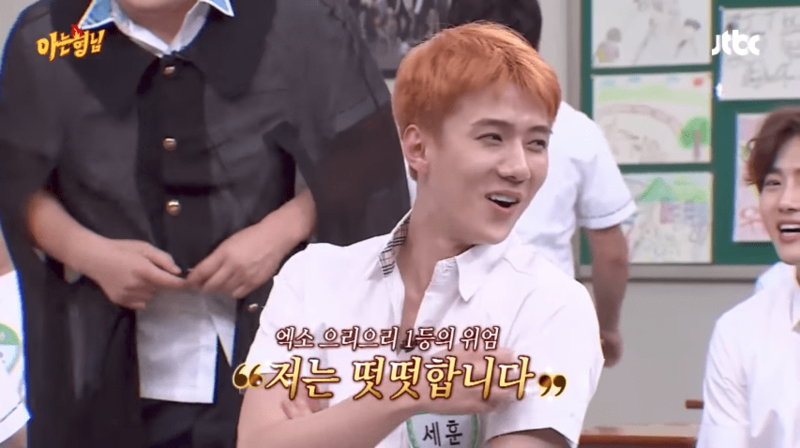 Although the cast asked if it was because he had wide shoulders, Baekhyun threw everyone for a loop when he instead said, “You know, there’s that saying about how men need to have big noses [to have]…,” and implied it was actually because of a certain attribute of Sehun’s. The hilarity didn’t stop there, as EXO also poked fun at D.O. and their first impressions of him, while Suho exposed how the members once pranked him.